Paint Out has been seen in print, video and TV, and heard on the radio on dozens of occasions, reaching many hundreds of thousands of people. We regularly appear in Archant print media titles including the EDP/NEN (circulation 50k), Norfolk Magazine (readership 34k), Norwich Resident (8k), Arts East. 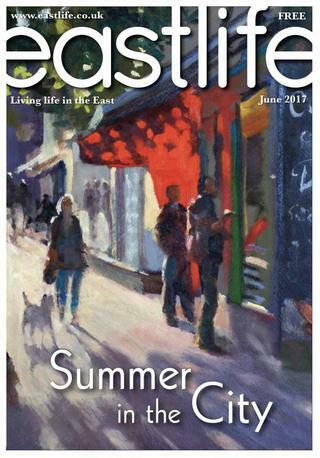 Our events show up in Art in Norwich, have been profiled in Leisure Painter magazine, feature on EastLife covers, and been mentioned in The Times arts diary. 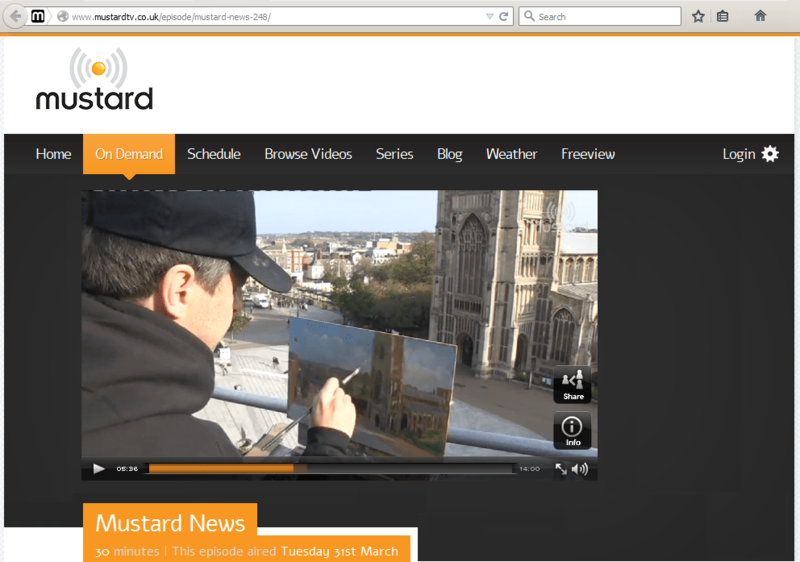 Paint Out has several times appeared on Mustard TV (viewers 122k/m), Future Radio (listeners 42k/m) and BBC Radio Norfolk (listeners 176k/wk). Paint Out has been filmed by Mustard TV, Norfolk Now, Tin Can Island TV, BBC Voices & City College Norwich Media Production Company, and by Giacomo Gex – some of which can be found on our YouTube channel(s). A number of budding artists from across Norfolk headed to Wells for the seaside town’s annual open air art competition, resulting in an exhibition of over 100 artworks. The Paint Out competition saw over 20 artists head to the coast over the weekend of September 15 to 17 and they were followed by hundreds of art dealers, collectors and locals who went along to see the results on display. Each piece was judged by art dealers and valuers, James Glennie and Nick Holmes, along with experienced open air artist Michael Richardson. The winner of the competition was Norwich resident Jack Godfrey, 40, who painted a piece titled The width of Wells. Mr Godfrey also won third prize at the first Paint Out Wells competition and was highly commended last year for his paintings of Brancaster Staithe. About 40 artists will be celebrating our fine city in paint when the annual Paint Out Norwich open air art competition returns for a fourth year as part of the Hostry Festival. And now organisers are inviting people to get involved in the running of the October competition in a number of different ways. Paint Out Norwich is developing a hosting programme and is looking for people to host some of the visiting artists taking part. There are also opportunities for volunteers to help with everything from stewarding to preparing the final exhibition, and businesses can also get involved via sponsorship, helping out with prizes, and a number of other ways. Artist Michael Richardson‘s painting, ‘Catch of the Day’, at Norwich Market, from Paint Out Norwich 2016 featured on the cover of the six-counties regional arts, life and culture magazine. After 30 years living in Edinburgh painting the landscapes of Scotland, Robert Nelmes decided that, to pursue his ambitions as an artist, he needed a change of scene — and that change was Roydon. Since settling into his new home in Snow Street earlier this year, Mr Nelmes has already made an impression on the region’s arts scene, winning one of the top prizes in the 2016 Paintout Norwich last month, against his own expectations. 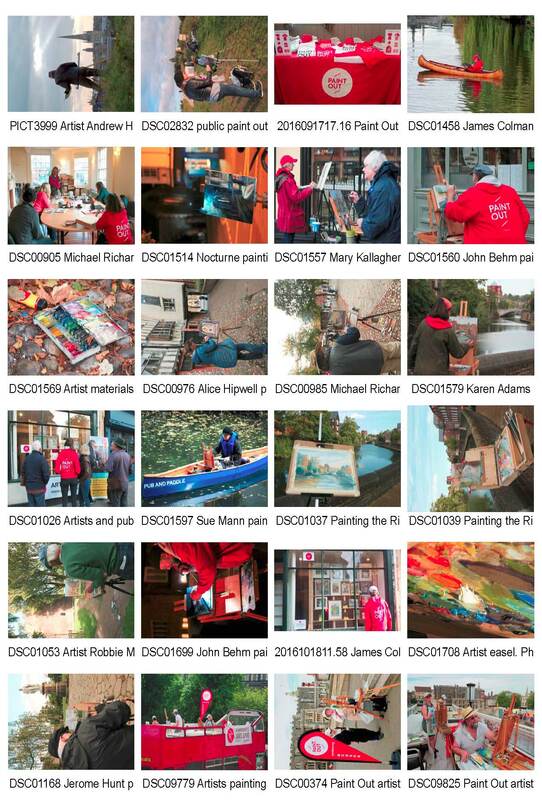 Dozens of members of the public joined professional artists when they took to the streets to capture the essence of one of Norwich’s most historic districts. Yesterday afternoon’s public paint out took place in Tombland, with artists setting up their easels around the cathedral, river and cobbled streets – with one venturing to Anglia Square to examine some of the city’s more modern architecture. The event was part of the wider Paint Out Norwich competition, which will see professional artists at work around the city today and tomorrow. From the beautiful views along the River Wensum to the colourful sight of Norwich Market, our fine city inspired an array of wonderful paintings during this year’s Paint Out Norwich open-air art competition. More than 30 artists took part in this year’s event and could be seen dotted around the city with their easels and paints earlier this week. Last night the winning artists were revealed at a gala event launching the Paint Out Norwich exhibition at Norwich Cathedral’s Hostry. The overall winner was Chris Daynes for his painting Yellow Canoe, which also won the oil category. The other four category winners were Between Showers by Richard Bond (watercolour), Guildhall Aglow by Alfie Carpenter (mixed media), Norwich Market by Robert Nelmes (freestyle), and Untitled NR1 by Tom Cringle (nocturne). The Norwich School painters were famous for their landscapes of Norwich and Norfolk in the 19th century. Now James Colman, organiser of open air art competition Paint Out Norwich, is hoping these master painters will inspire modern day artists competing in the event this month. In highlighting the Norwich School, James is carrying on what is perhaps a family tradition of putting a spotlight on the art movement, for many of the Norwich School works on show at Norwich Castle were bequeathed by the Colman family. James is hoping Paint Out Norwich artists will use these galleries as a starting point before picking up their paintbrushes. “I think the Norwich School collection is an important collection nationally and I think it’s wonderful that artists [participating in Paint Out Norwich] are able to see the city through the eyes of the Norwich School…They represent a gold standard in landscape painting from a particular era,” said James, an artist himself. He is keen to highlight John Sell Cotman’s watercolour of Bishopsgate Bridge, c.1800, which is currently not on display at the castle but provides a striking view of the River Wensum. The Paint Out Norwich artists hub will be close to the water at Anteros Arts Foundation and North this year, and the river will be a key focus for the competition. “The river is right there and you don’t have to go very far from your hub to paint a beautiful picture,” he said, adding artists are also being given the chance to paint from canoes, provided by Pub and Paddle. “By putting artists into canoes they will be down at water level and looking up generally, so hopefully you will get views of the cathedral that you wouldn’t other otherwise get, slightly unconventional views…and also reflections have very exciting potential,” he said. Up to 40 artists will take part in the main competition next Monday and Tuesday. There will be five categories – oils, watercolour, mixed media, freestyle and nocturne – and work created will be displayed at Norwich Cathedral’s Hostry. A gala preview, prize-giving and auction will take place on Wednesday and the exhibition will run until October 29. From October 16-18 dozens of artists will be setting up their easels on the city’s streets as Paint Out Norwich returns as part of the Hostry Festival at Norwich Cathedral. People are being encouraged to pick up paintbrushes and join professional artists in an open air art event in the city. Paint Out Norwich is returning this month for a third year and as well as holding a competition for professional artists, the event is also running a mass public paint out in Tombland on Sunday, October 16. Everyone is invited to join the competitors for the painting session and people could also have the chance to have their work displayed at Anteros Arts Foundation. The mass public paint out on Tombland will run from 1pm until 4pm on Sunday, October 16. On Saturday, October 15 there will also be artist-led workshops that are open to all – exploring colour for the studio and outdoors with David Lindsay, life drawing with Brian Korteling, and a dusk to dark nocturne painting experience with Michael Richardson. There will also be an egg tempera painting class for children aged six and over with Sue Mann and a social media workshop with Katy Jon Went. All the workshops are at Anteros Arts Foundation in Norwich and must be booked in advance. Paint Out Norwich is returning this autumn for a third year and people can now apply for the chance to join the competition. The event will take place in October and more than 50 artists are expected to be found dotted around the city capturing scenes of Norwich on canvas. There will also be a public paint out event in Tombland on one of the days, giving everybody the chance to pick up a paintbrush. The official awards may have already been handed out, but now the “People’s Choice” award for the recent Paint Out Norwich contest has been named. Liam Wales, 44, from North London, won the £100 prize money for the second year running after getting double the amount of votes that the runner up received. Art lovers of all ages visited the exhibition at Maddermarket Gallery [correction: Hostry Gallery] and voted for their favourite. The artist and illustrator took the award for the seven drawings he produced during the Nocturne Event [correction: Core Event] – a part of the competition which captured the city at night time between – as well as the day sessions at Mousehold Heath. A stunning watercolour of a Norwich memorial built to remember those who lost their lives in the Boer War scooped top prize in an open air art competition celebrating our fine city in paint. Richard Bond’s Winged Victory – depicting the monument by Castle Meadow – won first place in the Paint Out Norwich event which is now in its second year. Paint Out Norwich saw more than 40 artists paint some of the city’s greatest sights over three days last week, and on the final day members of the public joined them for a mass paint out on Mousehold Heath. Visitors to Norwich this week are being given the chance to witness the city being captured by a variety of talented outdoor artists. For the second year in a row, Paint Out Norwich is being held as part of the Hostry Festival, with 40 different artists occupying spots across the city and recreating them in paint in the hope of claiming £5,000 worth of prizes. The competition began yesterday with each artist producing four pieces of work, to be judged by an esteemed panel, with the winner set to be announced on Friday. The competition will be judged by Amanda Geitner, director of the East Anglia Art Fund, Marcus Dickey Horley and David Curtis. Dozens of artists are set to descend upon Norwich next week for an open-air painting competition – and budding painters of all ages and abilities are also being invited to join them for a special event at Mousehold Heath. Then on Thursday, October 22, members of the public are being invited to pick up their paintbrushes and join the artists for a three-hour mass paint-out event at Mousehold Heath from 1.30pm until 4.30pm. James Colman, who organises Paint Out Norwich with Will Buckley, said: “The Mousehold event is open to all ages and anyone who is a keen painter. Get out your brushes and come down and have a go. Another new addition for this year will be a nocturne painting event which will see a small group of artists out and about around the city on Tuesday and Wednesday night next week. A Mousehold Heath mass “Paint Out” and nocturnal illuminated Norwich are set to feature in the return of Paint Out Norwich, October this year. The organisers featured in a Mustard TV news piece and James Colman spoke to camera about the forthcoming Norfolk “Plein Air” competition. See the full news segment here (from 5m25s in – available to watch till 12 April 2015). A wonderful sweeping panorama of our fine city is set to inspire artists when an open air art competition returns to Norwich later this year. Paint Out Norwich – an open air art competition which saw seven Norwich landmarks celebrated in paint by 28 artists last autumn – will take to the city’s streets for a second time in October. Up to 50 artists will be dotted around Norwich competing in the two-day competition on October 20 and 21. At yesterday’s launch some new additions to the competition were revealed, including a mass painting event which will see all the artists gather together at Mousehold Heath to paint the city’s skyline on October 22. 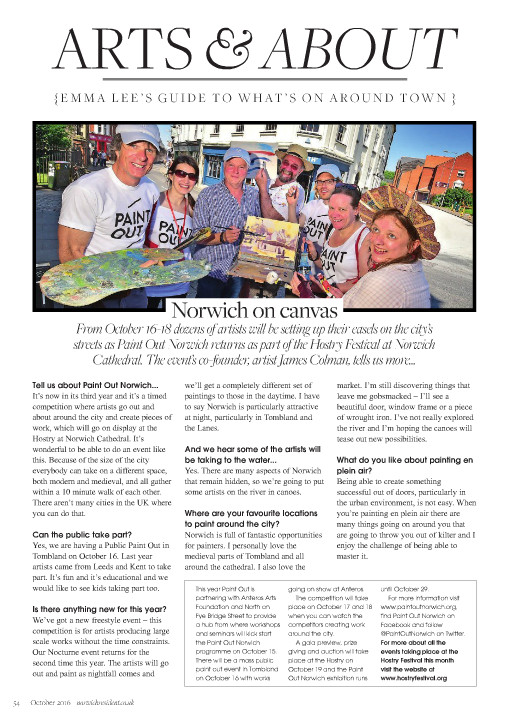 James Colman, who organises Paint Out Norwich with Will Buckley, said: “We are very excited about doing Paint Out Norwich again and that we are expanding it to include more artists. We are also going to diversify the programme so that we keep our core event from last year but on top of that we are going to have a select number of artists doing a nocturnal event that will run parallel to the day event. Artist Liam Wales has been named the winner of the People’s Choice award for the inaugural Paint Out Norwich competition. The open air art event – part of this year’s Hostry Festival – saw 28 artists take to the city’s streets over two days and create work which was then displayed at Norwich Cathedral’s Hostry from October 24 until November 2. About 5,000 people were thought to have visited the art show and the public were invited to vote for their favourite artist. Mr Wales won the People’s Choice accolade – and a hamper of art products donated by Norwich Art Supplies – for his work featuring Norwich Market, Norwich Cathedral’s cloister, Elm Hill, and a view from Norwich Castle. An oil painting of one of Norwich’s most historic streets has scooped first prize in the inaugural Paint Out Norwich competition. More than 30 artists have been selected to take part in an open air event celebrating Norwich in paint. The inaugural Paint Out Norwich – part of this year’s Hostry Festival – is a two-day en plein air painting competition which takes its inspiration from seven Norwich landmarks. Norwich Castle, Norwich Cathedral, The Cathedral of St John the Baptist, Pull’s Ferry, Elm Hill, and Norwich Market are all set to be the subjects of the competition – and the Forum has now been added to the list due to the increasing number of artists taking part. The Hostry Festival is launching its first ever Paint Out Norwich project, and it is inviting artists to apply to be a part of the open air arts event. Norwich Market, Norwich Castle, the city’s two cathedrals, Pull’s Ferry and Elm Hill are among the landmarks picked to be the subjects, and now organisers are eager to hear from artists who would like to get involved. The artists selected will spend a total of 12 hours over two days creating art in full view of the public, and the finished results will be displayed in an exhibition that will be part of the 2014 Hostry Festival in the autumn. The artist whose work most impresses the exhibition’s judges – who will include artist Colin Self – will also be awarded a £1,000 prize, plus there will be a special People’s Choice award voted for by the public. The new art event follows on from the 2013 Hostry Festival’s My Norfolk exhibition which celebrated the county in visual art. James Colman, from the Hostry Festival curating team, said: “For last year’s Hostry Festival exhibition we did a call to artists and had a reasonably conventional exhibition within the Hostry. This year we thought it would be a good move to take the visual arts into the streets of Norwich. 24 images (10Mb ZIP file – larger higher resolution images and RAW files 25Mb each also available). All credits and captions described in image file titles and EXIF data.